Racing conditions were wetter than wet, and even those drivers who were bemoaning a Safety Car start could be found over the radio calling for the race to be brought to an early end. One man who wasn't adding his voice to the chorus was Lewis Hamilton, whose main chance at securing the drivers' title for a third consecutive year depended on the race running to lap 54, so that he could secure full points - not half points - for the win and take the title fight to the season finale in Abu Dhabi. The first red flag came out thanks to a man in red, with Kimi Raikkonen parking his Ferrari into the wall along the pit straight. 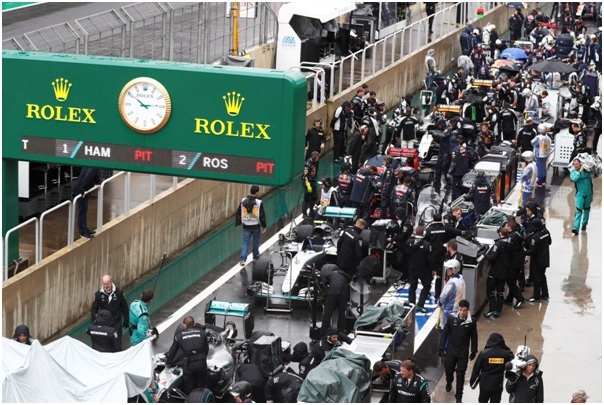 The second red flag - which prompted thumbs down and loud jeers from the fans in the grandstands - came out thanks to the threat of worsening conditions, prompting queries from several drivers as to why the race was being stopped in what they saw as normal extreme wet conditions. Hamilton, whose title fight depended on a good result at Interlagos, called for Charlie Whiting to bring in the Safety Car before the race was red-flagged for a second time, telling the team "It's not even that wet now, I don't know why we're stopping" when the second stoppage occurred. Valtteri Bottas agreed: "What is the reason for the red flag? It's just wet weather. Are we racing or not?" 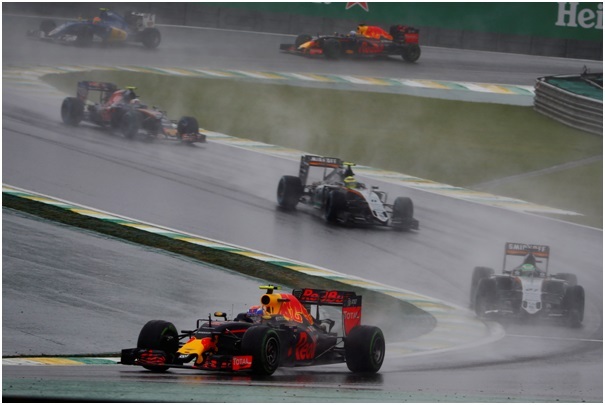 In a race that saw six retirements and a series of stellar performances, the hero of the hour was Max Verstappen. Running in second place after the final red flag, Red Bull called their driver pairing into the pits for a swap onto the intermediate compound that was always going to be a gamble. Felipe Massa's lap 48 shunt brought out the Safety Car, and both Verstappen and teammate Daniel Ricciardo took advantage of the opportunity to head back out on full wets, a move that saw both Red Bull drivers slip down to the back of the pack.